Embark on a journey through magical lands, as you endeavor to reclaim the Crown of Command. 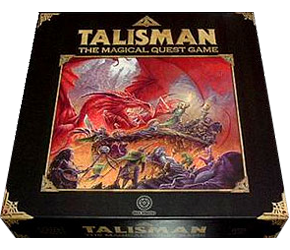 Some call it a classic, and early original editions cost a mint on eBay, but I’m sure a lot of the hoopla is due to nostalgia as Talisman is a pretty uninspiring roll-and-move fantasy boardgame. Still, after a few drinks it can still be a laugh. After a remake by Black Industries, Fantasy Flight grabbed the licence and has done a great job with the revised fourth edition, finally adding plastic character figures and subsequently, some fresh new expansions. Hi, do you have any plans for releasing a Rules Summary for the Warhammer 40k “Relic” board game modelled after this? I’m a big fan of the rules summaries you’ve made and would love to see one for Relic as well! There’s definitely a good possibility. Stay tuned! Loving the site especially the “Rules Summary” sections and also enjoying the foamcore tutorials. Can I ask are the Descent 2.0 box/foamcore dimensions the same as the Talisman and Relic boxes if not could you please, please, PLEASE put up a detailed plan for these. Keep up the amazing site! Long live the gamer! Thanks Shane. Basic FFG box dimensions should be the same, but every insert I do is designed specifically for the game. I don’t have Talisman with me at the moment but keep an eye out for a Relic plan in the not-too-distant future!